Dr. Hubertus Hoffmann, President of the World Security Network Foundation and Guenther Oettinger, EU Commissioner for Energy (left), at the Carlton Club in London: "The challenges facing energy supplies are of such complexity that no single Member State can resolve them alone. Europe is the world's largest regional market, and the world's largest importer. 27 Member States representing 500 million inhabitants are stronger than 27 separate countries." 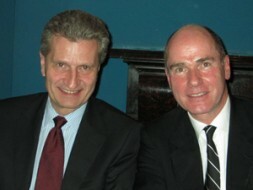 Guenther Oettinger, EU Commissioner for Energy, was interviewed by Dr. Hubertus Hoffmann, President of the World Security Network Foundation, at a dinner event hosted by WSN at the Carlton Club in London on the occasion of a workshop at the European Centre for Energy and Resource Security directed by Executive Director Friedbert Pflueger. Commissioner Oettinger explained the mix of renewable, fossil and atomic energy, the "Energy 2020" strategy, EU involvement in Central Asia, challenges and opportunities presented through the political turmoil in the Middle East and North Africa, as well as the strategic partnership with Russia. Hubertus Hoffmann:What should be the mix of renewable, fossil and atomic energy in Europe? Guenther Oettinger: In the next decade I think that we will still need to maintain a strong diversity in our energy mix and that all sources will still play an important role. And it is up to Member States to choose the best mix according to their specificities. At EU level we have defined clear and ambitious goals for renewables, with a target of at least 20% by 2020 for the overall share of renewable energy in our energy consumption and 10% for the share in transport. EU Heads of States and Governments have also committed to move towards a low carbon economy by 2050. This means a reduction of C02-emissions of 80 to 95% below the level of 1990. On nuclear energy, at EU level, it is our role to develop the most advanced framework for nuclear safety and security, and to promote the highest standards for nuclear safety, security and non-proliferation also outside the EU. Hubertus Hoffmann: What were the priorities in your first year as EU Commissioner for Energy and what has been reached? Guenther Oettinger: When I started as Commissioner I saw how important it is for all actors to have a clear view for the long term strategy: energy requires certainty in order to take today the decisions which will shape our future. Thus, my starting point was to define a common energy strategy for the next ten years. In November last year, we adopted the ambitious "Energy 2020" strategy which defines 5 priorities: to pass the gear up for energy savings, the completion of the internal energy market (including energy infrastructure), the empowering of consumers, the European leadership in energy technology and innovation and the better coherence in the European energy relations with third countries. All these priorities were fully supported by the Heads Of State and Government during the extraordinary European Council of 4th February. Their conclusions pave the way for several critical decisions in the coming months. Indeed, since last autumn, we have already shaped the coming proposals, in particular by defining the blueprint for the energy infrastructure or presenting a new Energy Efficiency Plan. We also gave priority to safety issues, in which the EU has a real added value: we can set up high binding standards throughout Europe which create trust between European partners through peer reviews. The new proposed standards for disposing spent fuel and radioactive waste from nuclear power plants, the safety assessments in nuclear energy that I proposed after the events in Japan or the coming proposals on offshore oil drilling contribute widely to the confidence which is needed to face the energy challenges to come. Hubertus Hoffmann: Could you please tell us about the background of the EU- Azerbaijan gas agreement and where this could lead in the next ten years? Which other central-Asian countries may follow? Guenther Oettinger: Azerbaijan is a key strategic partner for the EU and we have a shared interest for the security and diversification of our energy supply and demand well into the future. In January 2011 President Barroso and I visited the country and we signed a Joint Declaration through which Azerbaijan has committed to be a substantial contributor to and enabler of the Southern Gas Corridor and will provide gas directly to the EU. This is a very important step ahead. Simultaneously, we held highly productive discussions with Turkmenistan on its readiness to make available significant additional volumes at its border for a Southern Gas Corridor. These two partners are crucial in our efforts to diversify our energy supply in the next years. Furthermore, we are also in active discussions with Iraq about its potential contribution and, moving forward, I certainly see possibilities in time for other Central Asian countries to contribute further. The potential for a secure and stable agreement is there. But it requires a common European approach. Suppliers are very attentive to European moves and do not hesitate to take profit of our divisions: the EU must transmit a single message. Hubertus Hoffmann: The situation in the Maghreb is of great concern now in Europe with important consequences for energy supply in Europe- what should be done? Guenther Oettinger: Of course, the situation in North Africa and the Middle East is of great concern: the current changes and the democratic moves have to be supported. It has also consequences in terms of supply. For instance, following fights in Libya, gas and oil deliveries from this country have stopped. Until now it only had a limited impact on us, even for more exposed Member States, like Italy, thanks to the European solidarity and our capacity to develop alternative supplies. We are closely monitoring the situation in liaison with Member States, the IEA and industry stakeholders. At the international level it was possible to replace Libyan supplies by crude oil and petroleum products from other producers in the market. Today, all available information indicates that this replacement should continue to be feasible in the medium term. Moreover, the decisions taken in the last years benefited the European Market. The existing stocks should be sufficient to cover a shortfall resulting from the turmoil in the region for over 1000 days. The same is valid for the European refiners who have been able to replace supplies from zones which are currently in conflict. But the current situation goes further than immediate supply: we see a great opportunity to make our Euro-Mediterranean partnership a reality. We must now pursue and intensify existing cooperation and assistance programmes with Mediterranean countries to support regulatory reforms in the energy sector or building new ones with countries that are willing to do so. We must also ensure the Euro-Mediterranean energy security through fully exploiting the potential of cooperation in renewable energy and providing assistance to Mediterranean partners in modernising and better managing of their energy mix. In terms of financing, existing funding instruments should continue to give priority to energy integration in Southern Mediterranean countries both at national and regional levels, with a focus on renewable energy and cross-border infrastructure. We must also continue to support the development of an investment friendly environment. As ultimate goal, we could propose to our Southern Mediterranean partners to establish an "EU-Southern Mediterranean Energy Community" starting with a first group of countries ready to engage towards regulatory convergence and market integration. Hubertus Hoffmann: How do you see Russia- as a fair partner or a difficult power-player in energy? Guenther Oettinger: The Russian Federation is and will remain a key energy partner for the EU. Our energy systems are closely interconnected, and Russia is the most important external energy supplier for gas, oil, coal and uranium to the EU. Our energy interdependence explains the strong political and technical cooperation in the field of energy. Since 2010, we have very close consultations in the framework of the EU-Russia Energy Dialogue, which has been further strengthened in the past months. The Dialogue has established a trust-based relationship over time which I wish to further expand with my counterparts in the Russian government. It also provides a forum for industry and academics to discuss issues of common interest. This does not prevent us from having different interests and requests concerning the further development of our relations. In recent past, we have had intensive discussions on the diversification policy of the EU, on the adoption of new internal market rules in the EU and their impact on Russian companies, or on the situation of foreign investors in Russia. On all these issues, we try to find pragmatic and mutually beneficial solutions with our Russian partners. Hubertus Hoffmann: In the press you can read about big gas and oil giants involved in energy deals. How could smaller companies profit and support it? Guenther Oettinger: Some major energy actors are European. We should see this as a strength and it is important that they can compete at world level. However, competitive European energy markets are by no means the exclusive playgrounds of energy majors, there must also be room for smaller actors. Smaller producers and suppliers are often more flexible. These trends are not contradictory as such but require an open market which favours fair competition and protect the consumer's interests. The regulatory framework and the competition rules at EU level are essential to this respect. It is important to note that the internal market rules have facilitated competition and a level playing field all along the energy supply chain. This has created opportunities for new operators or utilities with a traditionally more local or regional focus. Such companies have been able to actively procure on wholesale energy markets and, indeed, jointly invest in new power generation facilities. Hubertus Hoffmann: What does Europe need for its energy security? Guenther Oettinger: The more we interconnect our energy markets and networks, the more secure our energy supplies will be. To do this, we urgently need to complete the internal European energy market, open up networks, create more interconnections, link up energy "islands" in the EU and enable electricity and gas to move freely. This is all the more important as we increase our use of renewable and locally produced energy. We need more flexibility in our networks to deal with fluctuating supplies, and we need a broader supply base to respond to variations in demand and supply. For example, when the wind is not blowing in the North Sea, we can make up the difference with solar power from the Mediterranean. Renewable energy and energy efficiency make an important contribution to energy security. Reducing our use of imported coal, gas, and oil also reduces our exposure to external supply threats and energy price volatility, which in turn undermines economic stability. Last but not least, the EU should do much more to assert its interests externally. The challenges facing energy supplies are of such complexity that no single Member State can resolve them alone. Europe is the world's largest regional market, and the world's largest importer. 27 Member States representing 500 million inhabitants are stronger than 27 separate countries. This must give us a lot of geopolitical muscle. We need a fully Europeanised energy policy, including clear common messages and a common voice. This is one of my top priorities for my second year in office.